Powers: The Silencer possesses no superhuman abilities. His uniform contains a device which nullfies all sonic energy within his vicinity. Hence, he cannot speak, nor does he makes any noises as he moves. He is also equipped with a gun which fires silent bullets, that do not make a noise even when they strike an object. 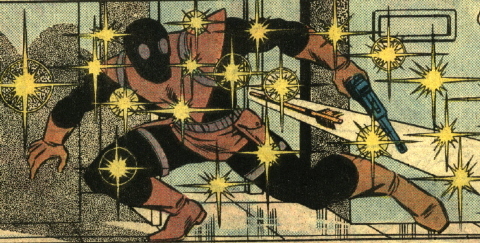 Finally, his costume is insulted, making him immune to attacks such as Hawkeye's electro-arrows. History: (Hawkeye I#2)- After the Avenger Hawkeye learnt that his employers, Cross-Technologies, had a secret, sinister agenda, the Silencer was dispatched by them to kill him. The Silencer found Hawkeye asleep in the apartment of his ally Mockingbird, and nearly killed him in his sleep, but Hawkeye awoke in time to dodge the attack. He was nearly killed in the course of their confrontation, but when Mockingbird returned home, he jumped out the window. Later that day, Hawkeye and Mockingbird infiltrated Cross-Technologies, hoping to learn what the business was involved in, and the Silencer caught them in their records room. He and Hawkeye fought again aboard his Skycycle, and wound up atop a smokestack. Hawkeye seemed to fall into the smokestack to his death, but climbed back out, caught the Silencer by surprise, and threw him down the smokestack. Comments: Created by Mark Gruenwald. The Silencer probably survived falling down the smokestack, or Crossfire would have said otherwise in Hawkeye I#4. His real name was revealed in Crossfire's entry in OHotMU A-Z Hardcover#3.